At Talk Mediation Centers, the focus is on achieving amicable conflict resolutions that are fair and acceptable to both parties, while consuming much less time and costing far less money. We do not represent either party as an attorney. Instead we use our legal experience and knowledge to help both parties make important and informed decisions together, for themselves. For residents in Greece, Irondequoit, Hilton, Brockport, Batavia, Gates, Chili and Spencerport, NY, the attorney-mediators in our Spencerport office will help you to learn how to communicate, how to plan and how to work together as a team to make important decisions, reach mutually beneficial agreements, and come to resolutions without animosity. Most divorces are completed in two or three mediation sessions of two hours each. We’ll schedule these sessions when it’s convenient for you and your spouse and we promise not drag it out, nor do we force you to make your schedule fit ours. Once you’ve addressed every issue and agreed on every decision, we’ll make sure your paperwork is complete, accurate, and legally binding. In less time and for far less money than a typical divorce. 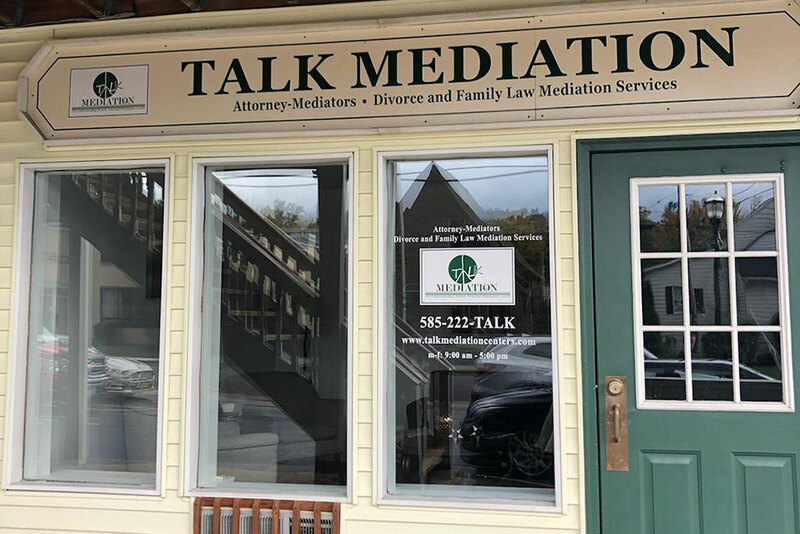 The mediators in our Spencerport/Brockport Talk Mediation Center are skilled attorneys, legally qualified to handle divorces and other family issues. They chose to leave the courtroom in favor of the mediation room because it is better, smarter, more financially responsible and—above all—more fair to everyone involved. Our attorney-mediators are also experts in collaborative conflict resolution. Each has completed an intensive 40-hour course on mediation and been certified under Part 146 of The New York State Unified Court System’s Alternative Dispute Resolution programs. Don’t do yourself, or your spouse and children, the disservice of hiring an attorney without talking to us first. Talk Mediation may spare you the emotionally and financially draining experience of a traditional courtroom divorce. Get a free phone consultation with our Spencerport/Brockport office and see how we can help.